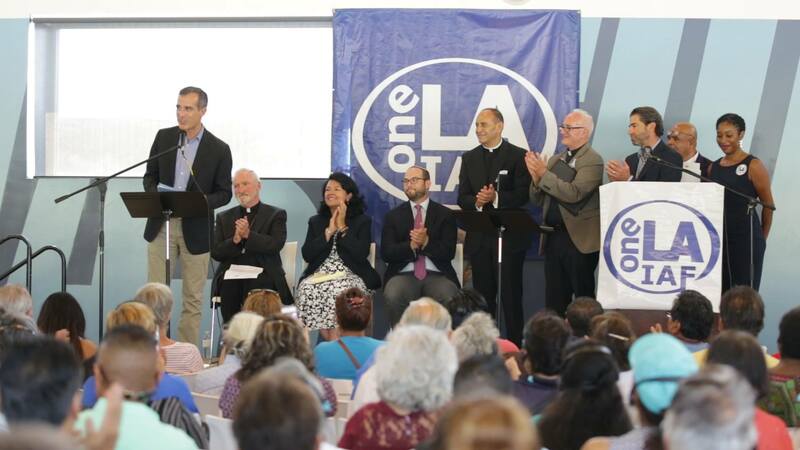 In response to compelling stories, and the presence of hundreds of delegates, Mayor Eric Garcetti committed to working with One LA on concrete solutions to the affordable housing crisis, including a proposed linkage fee that would generate $75 Million per year towards affordable housing construction. Garcetti not only became the first mayor of a major city to sign on to the national IAF-initiated "Do Not Stand Idly By" campaign for safer guns, he additionally pledged to persuade other mayors to sign on. After several young people shared stories about their immigration experience, the President of the LAUSD school board, Ref Rodriguez, pledged to support One LA and the Superintendent's efforts to create ways for the district to provide support to young "newcomers" (recent immigrant arrivals & unaccompanied minors). Additional officials in attendance who pledged their support included: LA City Attorney Mike Feuer; Mitch Katz, director of LA County Health Services; LA Police Deputy Chief Robert Arcos; and Bishop David O'Connell, San Gabriel Region of the Archdiocese.